Barack Obama’s foreign policy legacy and NATO: The president should lead a new, emboldened Western Alliance. It’s the best way for him to leave a meaningful foreign policy legacy. 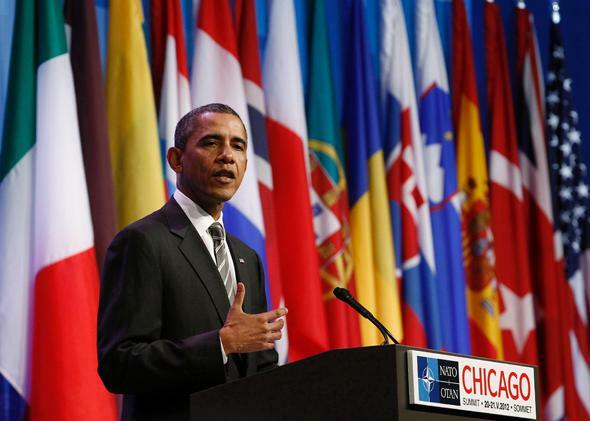 President Obama holds a news conference at the NATO Summit in Chicago on May 21, 2012. The answer is yes, of course, he can do something significant in two years. Two years is a lifetime in politics. Two years ago, no one imagined Russia would be at war with Ukraine. Two years from now, the map of the Middle East may be totally different. In 1948 and ’49, two years was plenty of time to conceive, negotiate, and write the original North Atlantic Treaty, the piece of paper that set up NATO. In two years, President Obama could reconceive, renegotiate, and rewrite a new North Atlantic Treaty, or at least restructure NATO so that it functions like a living organism and not like a Cold War relic. Not only that, he could start first thing next month, at the coming NATO summit in Wales. Certainly it is long past time for NATO to become more rigorous about its membership. Some Europeans don’t want to pay for their defense? Maybe those who want to be covered by Article 5, the alliance’s security guarantee, should now be obligated to pay. Perhaps those who contribute less than 1 percent of their national budget should be told that the guarantee no longer applies to them. Certainly there don’t need to be any NATO bases in countries that refuse to contribute. And a much higher percentage of their military spending money should go toward funding the NATO budget, so that NATO, as an alliance, can afford to pay for important operations. NATO also needs to become a lot clearer about its goals. Europe has two immediate security issues: the threat from Russia in the east, and the threat from Islamic fundamentalism to the south. NATO therefore needs two command centers, each of which takes care of planning and intelligence for defense against those threats. The basing of troops and equipment needs to be rethought completely: If we were starting from scratch, nobody would put them where they are now. NATO needs to shut down unnecessary commands and legacy bases, and move on. At the same time, NATO members should understand that any further enlargement is not charity work: Every time the NATO membership is extended to another state, current members have to be prepared to defend that state—and if they aren’t, then the enlargement should be stopped. Either Article 5 is an absolute guarantee, or it is worthless. Once NATO has become clearer about its real security interests, its forces can again start carrying out annual exercises, as they did during the Cold War. It’s time to rehearse our reaction to a Crimean-style Russian invasion of Latvia, led not by regular troops but by “little green men” pretending to be local Russians. It’s time to anticipate, say, a civil war in Libya or the fall of Baghdad. It’s time that NATO had a better coordinated cyberdefense and began to think more deeply about information warfare. It’s also time to face the fact that Russia may have already abandoned several post–Cold War arms treaties, including those covering medium-range missiles: If that’s the case, we need to abandon them, too. Deterrence worked in the past, and it can work in the future. Famously, Obama is bored by NATO meetings, and understandably so. At NATO’s 60th anniversary meeting in 2009, his first as president, each of the national leaders present made a speech. That meant not just 28 speeches from the 28 members but in some cases more: Both the Albanian president and the prime minister felt they needed to speak, for example. It’s time to take NATO meetings at all levels more seriously. Countries that have more knowledge or influence on a particular hot spot should lead the discussion: France on Mali, for example, or Estonia on Ukraine. The secretary-general should make clear that countries not participating in a given conflict should remain silent. No more boring pre-prepared remarks: Conversations should be real, not staged. All of these changes are possible. Obama might not have the power to make Congress do what he wants, but he does have the power to relaunch the Western Alliance. He has all of the cards—the U.S. contributes three-quarters of NATO’s budget—as well as the ultimate argument: If the Western Alliance, as currently constituted, no longer wants to defend itself, the U.S. can always leave. That might sharpen minds quickly enough to give Obama a foreign policy legacy that would last.